As an NJ customer, do you find yourself only in one or two sections of the catalog, or always hitting the same tab on the website? In the forthcoming weeks, some of the “Wide Line” entries will be highlighting a variety of products and some of the industries that we work with that you might not expect. This week we’ll focus on Sqwincher Activity Drinks. Sqwincher products speak to a major industry need for our customers, as well as within our own operations at Nelson-Jameson. Hydration at the workplace has a lot to do with safety, health, and productivity. 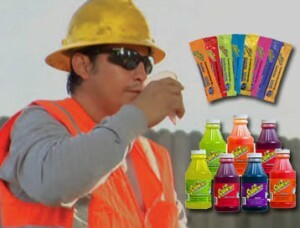 A piece in the Journal of the American College of Nutrition states, “Athletes and industrial workers comprise the populations that are most often challenged by hydration issues; however, industrial workers are another often-overlooked population sharing these concerns.” Like Derek Jeter or Eli Manning on the field, workers in industrial settings should be focused on proper hydration on the floor. The study discusses that this reality can pose some significant issues for workers and businesses. Dehydration can affect cognitive skills including alertness, an obvious concern when it comes to workplace safety. In addition to such health issues, the authors cite one study that indicated a 12% drop in productivity when employees were dehydrated. When alerted to the effects of dehydration in the workplace, it can definitely make one start to feel thirsty for some answers. Sqwincher, a company that has become an industry mainstay for hydration concerns may have some practical answers for your operation. Founded in 1975, Sqwincher is a “leader in electrolyte replacement drinks” and “has been credited with improving workplace safety, hydration, and focus in high-heat industrial environments.” Sqwincher products are made in various forms and feature a variety of flavors. In individual packet form, powder packs, and concentrates, Nelson-Jameson offers customers a wide variety of choices. The spectrum of choices allows individual operations to develop an effective and accessible hydration program, with a product that employees enjoy drinking. For more information on Sqwincher Activity Drinks and the most effective ways to incorporate them into your operation, contact: Carol Blakey- Safety & Personnel Product Manager, c.blakey@nelsonjameson.com, 1-800-826-8302 ext: 1045 or visit our website. This past March, the Food Industry Suppliers Associate (FISA) and Nelson-Jameson afforded Dakonya Freis, MRO Department Manager, and me the opportunity to attend the University of Industrial Distribution (UID). UID is a concentrated educational seminar focused on programming that relates to the unique needs of the industrial wholesale distribution industry. Any person working in the industrial distribution and supply industry is welcome to attend, but attendees’ companies must be a member of one of the over 30 trade or professional organizations that currently sponsor the UID program. As a member of FISA and an employee/owner of an industrial distributor, I felt that UID would provide me with an invaluable and exclusive opportunity to learn how to improve Nelson-Jameson’s procedures and performance. The University of Industrial Distribution takes place annually over a 4-day span in early March on the campus of Indiana University Purdue University Indianapolis (IUPUI). This year, approximately 500 participants from a very wide array of industries attended classes of their choosing that were led by distribution experts and educators. Course topics varied in scope from broad to niche, but overall themes included finance, marketing, operations and management. Dakonya chose courses that closely related to her role in category management, and I gravitated toward courses that would help me gain a better perspective as to how to succeed as a distributor. The content of my courses was constructive and motivating, and my hope is to integrate modified-versions of some of the innovative strategies and suggested processes learned into current operational practices at Nelson-Jameson. This is the final article in a series of three articles focusing on 5S methods. In this third of three pieces on the 5S program (you can learn more about 5S and associated products by clicking here or here. 5S is a method developed to create standardized, efficient, clean, and safe working environments. A common way of implementing 5S methods in facility is through the use of color-coding. 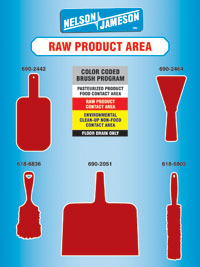 An effective color-coding system in a kitchen, factory, processing facility, hospital, etc. does a lot to help meet the “standardizing,” and “sustaining” components of the 5S method. With no absolute standard set for color-coding, each business can tailor-make their system to meet their own needs. A multiplicity of colors can be used in one area. In an industrial kitchen, a specific color like white can be used to label all materials okay to use with dairy products, versus a red color scheme to indicate tools and materials that are okay to use with raw meat. Such divisions prevent cross-contamination, and the spread of dangerous bacteria and illnesses. Products from cutting boards to maintenance equipment come in an array of colors to meet the needs of operations using multiple standards in one place. Another common method of utilizing color-coded products to help standardize the workplace and sustain 5S demands is to create specific “zones.” The need to standardize certain areas of a specific operation is often the reality for many businesses. Respective zones in an operation are assigned a specific color. Multiple tools and supplies will be coded in this one color, eliminating or reducing confusion, cross-contamination, and loss. If zone paths are ever to cross, such as a maintenance department working on a project within a packaging department, zone color indicators will keep tools and other materials clearly delineated for employees. Such user-friendly indicators as color-coding on materials and tools ensures that after standardizing your operation, you will be able to sustain the 5S methods for years to come. Click here to check out Nelson-Jameson’s line of color-coded products and for more information on how to make the most of color-coding in 5S. This is the second article in a series of three articles focusing on 5S methods. In last week’s article, we took a brief look into the 5S method. This step-by-step method of workplace organization has been successfully incorporated into an array of settings: from industrial work floors to governmental offices. In this second of three pieces examining 5S, we’ll focus on a relatively simple but extremely effective product that can be used in a 5S program: our custom-made Store-Boards™. The Store-Board™ is a practical way to address the “straightening,” “shining,” “standardizing,” and “sustaining” portions of the 5S method. These custom-made boards allow you to pick the material, equipment depicted, color, size, and hanging device. You can also add your company’s color-coding chart, company name, and logo. The Store-Board™ is an easy way to further refine or to start your 5S program. After discerning what are the necessary tools and materials in the different areas of your facility, the boards provide a clear visual that straightens out tools for easy viewing. This, in turn, assists in helping keep work areas clean, efficient, and safe. The use of these boards throughout your facility standardizes expectations and the organization of materials for all employees, no matter the department or workspace. In the challenging mode of “sustaining” 5S in your facility, the boards act as a simple and accessible tool to keep these standards going. To find out more about the benefits of 5S in a food industry setting specifically, you can count on Nelson-Jameson, Inc. as a resource for your 5S questions. We provide numerous products to reach your 5S goals including The Store-Board™. For more information on The Store-Board™ click here to see a video. Next week, we’ll take a look at color-coding systems and their usability in a 5S program.